"Bob Bradley's Pit Terminology - Glossary and the Glossary on the Durham Mining Museum website (the DMM) include descriptions of some of the terms, e.g canch, that I use in this note. The everyday setting in which some of the other terms were used is explained in some of the chapters in these parts of the DMM." Mr F(red) Penny in the Staff Department had oversight of the Student Apprentices and Directed Practical Trainees of No 4 Area, Durham Division. He kept a fatherly eye on how we were progressing in our technical education and in the acquisition of the required practical experience. As part of the latter he was always on the look out for special work that was taking place and made arrangements for at least some of his “students” to see what was entailed. I can recall two pieces of special work that I was sent to see. The first I attended was the installation on a coalface of No 4 Area’s first German designed armoured flexible conveyor and coal plough. replaced at intervals of not more than 3 and a half years. I was present when the rope attached to the cage in the Mainsforth Colliery upcast shaft was recapped. The recapping process required shaftsmen to stand on the top of the cage whilst it was on the keps at the top of the shaft. Mr Penny also ran monthly meetings of his “students” most of which were held at the Tursdale Miners Training Centre. He was not averse to using the get-togethers to take us out and about. I remember visiting Westoe Colliery on the Durham coast to see the colliery’s skip i.e. a new system for raising coal up the shaft. A skip was a large container into which the loose coal was loaded in bulk. At Westoe the tubs were unloaded near the shaft and the loose coal transferred to the skip for its journey up the shaft. In our pits cages that could carry between 2 and 6 one ton capacity tubs at a time brought the coal to the surface. 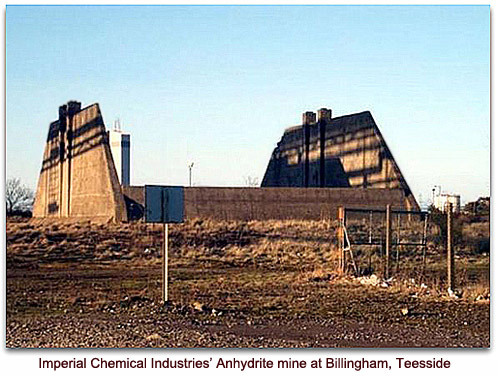 We visited the Imperial Chemical Industries’ Anhydrite mine at Billingham, Teesside. You can imagine our surprise when we saw huge dumper trucks of the size used in opencast mines and in the construction of motorways running in the mine’s underground roadways. By comparison the roadways in which underground locomotives ran in our pits were relatively small. Visits were made to factories where mining machinery was manufactured e.g. Huwood in the Team Valley, near Gateshead, and Underground Mining Machinery in Newton Aycliffe. Mr Penny was happy to take the group on visits to places not directly connected to mining. One was to the Wills cigarette factory somewhere near Newcastle upon Tyne. A couple of others that I remember took us to the breweries of Nimmos at Castle Eden and Vaux at Sunderland. Testing the brewery’s product was of course an essential part of the visit. The practical experience side of my Student Apprenticeship programme was mostly spent working alongside and performing the same day to day tasks as those undertaken by people for whom I would have overall responsibility if I became a mine manager. 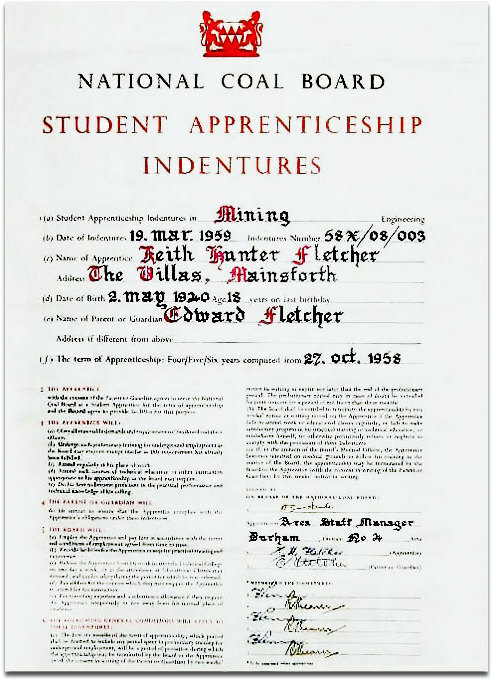 In the first few months of my apprenticeship I spent a few weeks working for the Mainsforth Colliery Surveyor. Some longwall face workers were pieceworkers i.e. paid according to their output. The Surveyor’s staff visited each piecework coalface every Friday to take measurements of the length of the face, of the main gate and of the tail gate. The measurements taken on each such face were compared with those taken on that face the previous week and the difference between them used to calculate how much the workers on that face would be paid on the following Friday. There was a whitewashed centre-line on the girders in the main and tail gates of a face. The line was used to keep the gates advancing in the direction it was intended they should follow. The Surveyor’s staff extended the lines whilst on their Friday visits. Roadways had to be driven to open up areas of the pit’s reserves so the coal could be mined. Some of these development roads had to be driven on a specific grade as well as in a predetermined direction. The girders in them had centre and grade lines whitewashed on them. Each week the Surveyor’s staff extended these lines. His staff also took weekly measurements on those development roadways being driven by stone men on contract i.e. under an agreement setting out the rate, say per yard advanced, at which they would be paid. Some piecework faces were easier to work than others so a quarterly system of casting lots, called cavilling, also known as calvilling, was used to allocate the place in which a filler would work in the upcoming period of three months. Cavils could also be cast to allocate the “driving” of main development roadways between teams of stone men. I next spent a period working in different outbye parts of the mine i.e. away from the coalface. During that period I worked on some haulage systems. Miners were prohibited from riding on haulage systems except on a system specially designed for the purpose e.g. in man-riding carriages pulled by an electric battery or diesel engine powered locomotive. I understand that riding on some main roadway “rubber” conveyor belts became an acceptable way to travel on the way out at the end of the shift. In all the years I worked underground you could be sacked if caught riding any conveyor belt. Relatively early in my Student Apprenticeship a couple of colleagues and I were sent to the Tursdale Apprentice Training School where apprentice electricians and mechanics learnt some basic skills. The purpose of our being there was to learn one or two of those skills. We learnt to saw, file, scrape metal and use micrometers/feeler gauges before being let loose on vertical drilling machines, mechanical shapers, lathes, millers etc. Towards the end of our stay we were asked to attempt a couple of the test pieces the apprentices had to complete on their way to passing out of the School. The test I remember was to produce both a metal square with a square hole in the middle and a second metal square just thousandths of a millimetre smaller in length and breadth so that it just passed through that hole. My result was acceptable. Shortly after this I undertook my coalface training at a time when in my neck of the woods the most advanced form of mechanised coal mining was the use, after “shotfiring”, of a coal cutting machine fitted with "boxes"/"paddles" instead of picks to load the coal on to the “rubber” face conveyor. There were still longwall faces on which fillers hand-shovelled the coal on to the face conveyor. I spent a total period of more than a year as a coalface trainee on the Mainsforth Colliery Training Face in the Mainsforth Hutton seam. It was an advancing longwall face on which hand filling was used. A Coalface Training Instructor worked alongside the trainee. Coalface trainees took turns driving the pit pony that hauled the coal tubs from the end of the main gate conveyor to the seam’s main and tail haulage system. I had the pleasure of being that pony driver a few times. I did not need much skill. The pony knew what needed to be done better than I did. He would come and stand near the tub when it was ready to be moved away from the end of the conveyor. When unhitched on the approach to the main and tail he would step out of the way of the still moving tub into the parallel set of rails where he would wait patiently for me to take him back for the next tub. It was almost as if the pony could talk. Three shifts of miners were needed to complete the cycle of operation on a hand-filling longwall face. In the first shift the coal was undercut, generally at the bottom of the seam. This is the shift on which this recollection of my coalface training begins. Each hand-filling longwall face had a coal cutting team. I spent a little time as a member of the Training Face’s team. The coal cutting machine or “cutter” was normally “stabled” at the end of the face at which its previous cutting run had finished. The miner who controlled the cutter - the cutterman - was the head of the team. Cutting machines of the type we used were flameproof electric devices manufactured in conformity with the relevant provisions of the mining legislation. Each machine had a set of controls at one end and at the other a 6 feet long jib around which ran a chain with removable picks. The jib could be swivelled so that it could work at a right angle to either long side of the machine. Power was supplied to the cutter’s motor by a flexible armoured cable plugged in to the end with the controls. After switching the cutter on the cutterman could flip a switch to start and stop the chain rotating. Before cutting could begin the cutter had to be positioned so that the controls were at the end facing in the intended direction of travel. Once this had been done the cutterman started the chain rotating and skilfully manoeuvred the jib in to the coalface. The jib was secured in place once he was happy that it was at a right angle to the length of the face. A length of wire rope was then run out from a drum on the machine and the far end anchored at a point down the face. With the chain rotating the machine was slowly winched along the face. Whilst the cutter was cutting water was continuously sprayed through nozzles mounted along the jib in an attempt to suppress the dust produced by the picks. A kerf or undercut approximately 6 feet deep was cut in the seam as the cutter traversed the face. The swarf created was dragged out of the kerf by the rotating picks. A device called a gummer attached to the cutting machine in the vicinity of the jib pushed that material into the track down which the cutting machine had just travelled. A second member of the team – me, most of the time I was on the team - shovelled the drilled swarf on to the face conveyor and pushed sprags or pit props into the gap to prevent the coal from sagging. Sagging could cause cracks in the coal making holes, which would be drilled into the face later, unusable for shotfiring purposes. I do not recall the time in or after coal cutting at which the driller started to drill the holes. Nor do I recall when the shotfirer detonated the explosives following the procedure I described in my note on Officials. However, at least some coal blasting had to take place before the fillers were able to work. Each filler was allocated his own stretch of coalface to work. They shovelled the loose coal on to the bottom loading “rubber” face conveyor. In the course of doing this they protected themselves and others by following the Support Rules laid down by the Colliery Manager and hammering three pit props tightly under steel bars or wooden planks to support the roof. When a filler was not able to use a combination of props and a plank immediately he would use a temporary prop to support the roof. A temporary prop was a prop topped with a wood cap/bobby - a thinnish piece of wood slightly bigger than the diameter of the prop. The South West Durham seams being worked in the 1950s and 1960s were rarely of a height that allowed fillers and other miners to stand whilst on the face between its gates. The Mainsforth Training Face was not unusual in not being high enough to allow you to kneel to work. We spent long periods of our shifts lying on our side with a thinnish pit prop under the shoulder for support. There were at least three teams of miners in the shift that followed the fillers. One team worked in the main gate, another in the tail gate and a third on the face between the gates. The miners in the groups working in the gates were referred to as stone men and those in the group working on the face as pullers or packers. When the fillers finished their shift the coal on the face had moved forward about 6 feet from where it was before the coal cutting team had started its shift. As a result about an extra 6 feet of the base of the rock overlying the seam had been exposed between the ripping lip of each gate and the coal on the face. It was the job of the stone men to deal with this stone so that the ripping lip moved forward by that amount. The stone they worked on was usually referred to as the canch. I was a member of one team of stone men whilst on the Training Face. Early in the shift holes were drilled in the canch. A shotfirer detonated explosives placed in the holes to produce handleable pieces of rock. Once shotfiring was finished the team supported the newly exposed area of the gate by erecting arched girders, which came in halves that had to be joined together by fishplates and bolts. It advanced a safety device meant to stop stones breaking off the ripping lip i.e. the newly exposed rock face. The debris created by the shotfiring was cleared and used to build packs along each side of the roadway behind the newly erected girders. The packs were built using the larger pieces of rock to form a rectangle of walls of a similar construction to the dry stone walls seen when out and about in the country. As the walls were built the void was gradually filled with the smaller debris. One wall was built a little more slowly than the other three so that the inside space could be filled as near to the roof as physically possible. In the time I worked with the Training Face pullers we moved the face conveyor forward into half of the track from which the fillers working in the previous shift had shovelled the coal. We then removed - pulled – the supports under the roof of the track in which the conveyor had previously run. Some of the supports removed were props and roof bars/planks. We moved chocks forward to just behind the new conveyor belt track . The roof from which the props etc. had been removed generally fell into the goaf. We used some of the debris this provided to build packs at intervals along the face. At different collieries and on coalfaces gaining experience of different methods of working and different geological conditions. Accompanying fitters, electricians, safety officer etc as they went about their duties. Towards the end of my apprenticeship I spent a couple of periods in the Planning Department of No 4 Area, Durham Division. These attachments made me realise that the future of mining in South West Durham was not as rosy as some might think. Reserves were running out. Future development in some areas was limited by the presence of difficult geological conditions such as faults. Abandoned workings, some containing water, ruled out development in others. I became a Directed Practical Trainee shortly after being told I had passed the 1966 final exams of the Higher National Diploma in Mining Engineering. 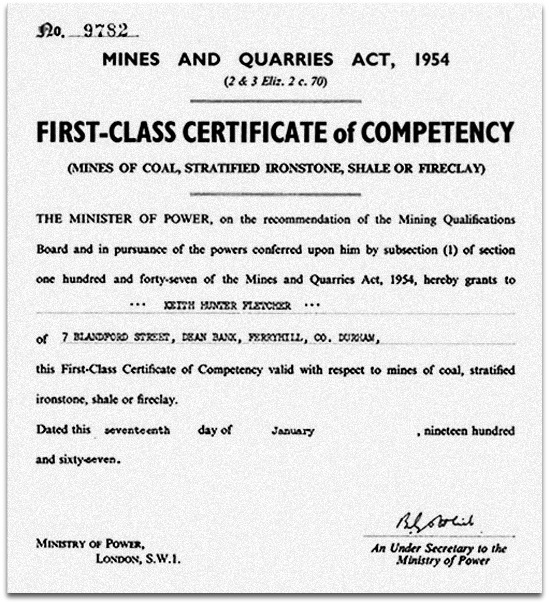 I received my Colliery Managers certificate in January 1967 after passing the exam held in the autumn of 1966. I left the mining industry at the beginning of March 1967.